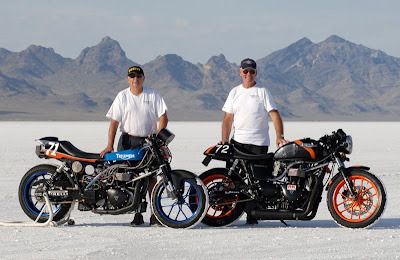 ATLANTA (September 15, 2009) – Five new world land speed records have been set on Triumph motorcycles during the 2009 BUB Bonneville Speed Trials at the world famous Bonneville Salt Flats. 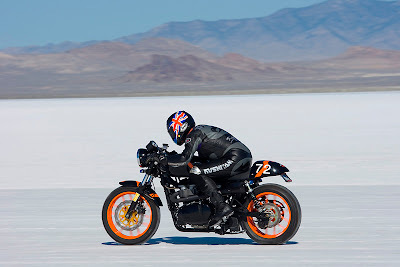 British racing journalist Alan Cathcart of Denemoore, Claverdon, UK, teamed up with South Bay Triumph owner Matt Capri of Lomita, California to set the records with the iconic British motorcycle at its namesake race course. Cathcart rode a street-legal Triumph Thruxton that was prepared by Capri to three records in the FIM’s 1000cc Normally-Aspirated Twin-Cylinder Unstreamlined class. The duo set new two-way FIM World Records for the flying mile at 152.678 mph and the flying kilometer at 152.770 mph as well as a best one-way speed of 153.150 mph. Cathcart also rode Capri’s turbocharged South Bay Triumph Bonneville to two more FIM World Records for the 1000cc Forced Induction Twin-Cylinder Unstreamlined class by turning in a two-way speed of 165.405 mph for the flying mile and 165.672 mph for the flying kilometer. The bike’s best one-way speed was 171.624 mph. The mile speed also qualifies for a new AMA record. The Triumph Bonneville was born in 1959 to recognize Johnny Allen’s land speed records at the Bonneville Salt Flats. The Triumph Bonneville was an instant hit in America and the UK, and 50 years later continues to be one of Triumph’s most iconic motorcycles. Despite its classic appearance, the new Triumph Bonneville motorcycles feature state-of-the-art design and performance. While the Bonneville first debuted with a 650cc power plant, an 865cc air-cooled parallel twin engine is the heart and soul of today’s motorcycles. A 360-degree firing order gives the new Bonneville the engine characteristics of a classic twin, while twin balance shafts and state-of-the-art production techniques ensure 21st century refinement and reliability. Ninety percent of peak torque – a healthy 51 ft.lbs. at 5,800rpm – is maintained from around 2,500rpm through to the redline, providing smooth and effortless acceleration through all five gears. ATLANTA (Feb. 20, 2009) – Triumph has great news for motorcyclists. The new Thunderbird is scheduled to arrive in North America late June, nearly two months ahead of schedule, and Triumph North America is now processing deposits for the first wave of Thunderbirds that will hit the shores. The Triumph Thunderbird has been designed from the ground up to feature an innovative 1,600cc parallel twin engine, six-speed transmission and 200mm rear tire. 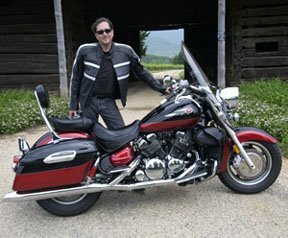 The new bike’s namesake first landed on North American shores in 1946 and received rave reviews from motorcyclists for its styling, agility and speed and later appeared alongside Marlon Brando in the blockbuster movie “The Wild One.” The new Thunderbird is a radical departure from its ancestor, but promises to live up to its legacy. To reserve a new Thunderbird, customers should visit their local Triumph dealer to place a deposit, complete a Reservation Form and have their dealer fax it to Triumph North America. Once the form has been received, Triumph will assign the reservation to the next delivery slot and send a confirmation email to both the customer and the dealer. The email will confirm receipt of the reservation and will indicate the expected month of delivery. As shipments are received from the factory, motorcycles will be sent to the dealers for customers in the order that the reservations were received. The special order program will run until July 1, 2009. Triumph is air-freighting four prototype Thunderbirds to Daytona (Fla.) Bike Week for display at the Triumph Demo Truck, which will be located at Daytona International Speedway. Daytona Bike Week is scheduled to take place from Feb. 27 to March 8. The Thunderbird also will be easily customized to meet each rider’s own styling tastes and riding preferences with a long list of Genuine Triumph Accessories that include a long haul touring seat, windshield, passenger back rest, luggage rack and leather saddle bags. North America has always had a special relationship with Triumph because of the spirit that Triumph represents. Like the motorcycles themselves, people who ride a Triumph tend to be quietly confident and have a distinctive sense of style that never goes out of fashion. Triumph survived bankruptcy in the early 1980s and a devastating fire that destroyed its factory in 2002. Unfazed by the challenges, the company continues to recapture peoples’ hearts and minds as they take to the streets to discover the thrill and enjoyment that only a Triumph motorcycle can provide. Triumph is now one of the world’s fastest growing motorcycle manufacturers in the world. In this video our buddy, Robert Pandya, the new spokesperson for the International Motorcycle Shows talks about this years motorcycles for women and/or the vertically challenged. This video is part of an ongoing series called "New to 2" highlighting what's new on two wheels. Some folks have just too much time on their hands!